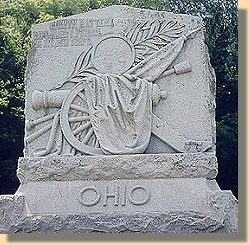 This Monument is located on the south side of Union Avenue approximately 100 yards west of the Navy Memorial. This unit was attached to Col. Charles R. Woods's 2nd Brigade of Maj. Gen. Frederick Steele & Brig. Gen. John M. Thayer's 1st Division, of Maj. Gen'ls William T. Sherman & Frederick Steele's XV Army Corps and was commanded by Lt. Col. William B. Woods. 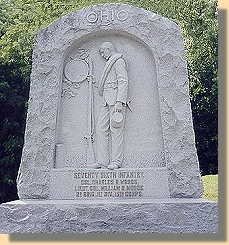 This Monument stands at the location of Grant's Headquarters during the siege. His Headquarters was initially in a wood frame house, but the house was dismantled for use by the troops. He then moved his headquarters to a tent, also at this location. 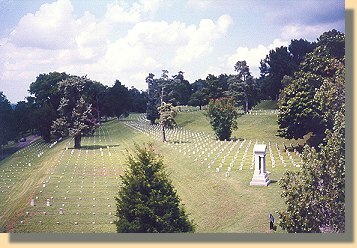 The National Cemetery at Vicksburg contains over 17,000 Union soldiers, of which over 13,000 are unknown. 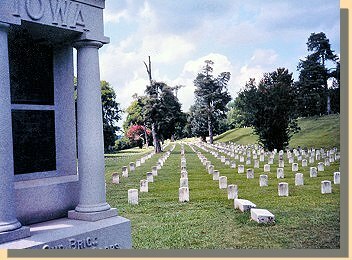 Confederate dead are buried in the Vicksburg Cedar Hill Cemetery. 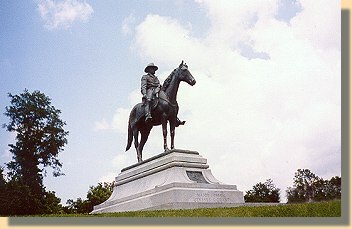 It has over 5,000 Confederates, of which around 3,400 are unknown.